Marieke Prinsloo-Rowe, a Fine Arts Masters student, is the lady responsible for the series of sculptures recently erected on the Sea Point Promenade. This sculpture is one of 18 that will be on display until June 2011, and which form part of a project to help establish a better Public Art Policy for the City of Cape Town. 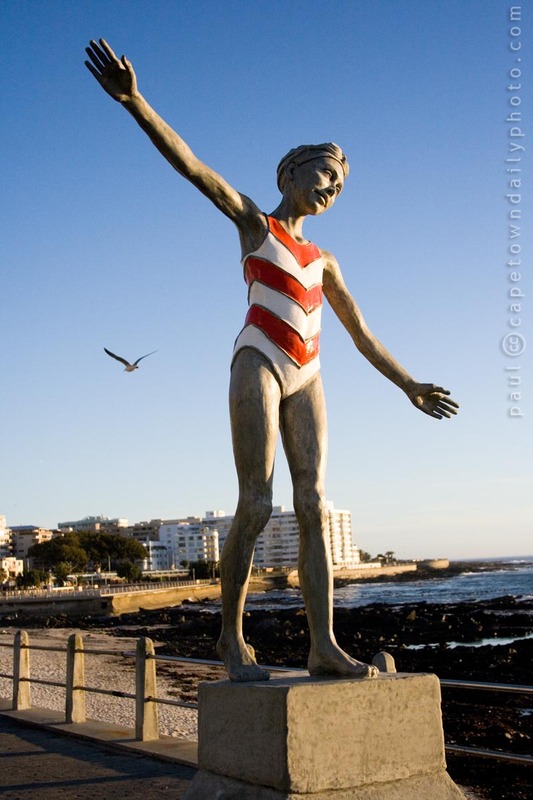 This sculpture of a young girl represents "a young South African democracy", full of hope and promise. Read more about the project and the other sculptures in the Walking the Road display on Marieke's website. Posted in General and tagged art, statue on Wednesday, 23 June, 2010 by Paul. Interesting and it’s good to see that they’ll still be there when we come out next year. Hi, think your site like PDP is great, stumbled on it by accident. Thanks Bev, and yes, that’s exactly what we did. Winchester and the sculpture walk. :) Sorry about the terrible way in which England exited the World Cup. That really was a slaughter. I believe that there’s a group of guys waiting for someone to pack their bags… interested? Paul, you know, that’s not a bad idea at all. Perhaps we will, and hey, perhaps Leapfrog will sponsor it. :D I’d say that we’d wait until better picnic weather, but hell, today was awesome weather for a picnic! Paul I think there were a few hundred thousand folk who would have rushed over and packed there bags for them – overpaid group of men that need to get their act together and very quickly, and as for their Manager well least said the better!! So pleased you like the Winchester Mansions – have you done a Sunday morning breakfast there? Bev, oh well, forget about them now. Who do you support next? I love your work and would like more info – prices? Exhibitions? Marguerite, perhaps it sounds like a strange questions, but are you referring to the photos or the sculpture?